The man who still cites the Columbine Massacre as evidence of videogames' effects on kids has publicly announced that he disapproves of the recent Supreme Court verdict. A lot of people have been coming out of the woodwork lately, lambasting the Supreme Court for its recent ruling in favor of the videogame industry. This week, the Archbishop of Denver Charles J. Chaput has publicly slammed the decision with in a new opinion piece for First Things, titled "Violent Video Games and the Rights of Parents," claiming that the decision is "wrong" and will "poison" the country. 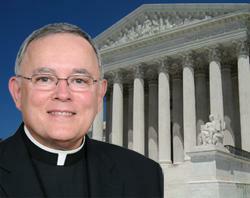 Admittedly, Chaput does acknowledge that he doesn't think all games are bad, but he does note his problem with the fact that the recent decision "extends and elevates the individual's right to free expression - or in this case, a corporation's right to make a healthy profit - at the expense of family sovereignty, the natural rights of parents and the intent of the Constitution's authors." There's about fifty things wrong with that statement, so let's just move on. Aside from this, he also argues that allowing children access to violent videogames violates "natural law and natural rights," and seems to ignore all the industry safeguards in place to prevent minors from buying M-rated titles. However, this piece isn't all that surprising to read, since Chaput has been an opponent of violent videogames since the 1999 Columbine shootings. He claims the massacre was "indirect but brutally real proof" of the effect games have on kids. On top of this, back when he addressed a special session of the U.S. Senate Committee on Commerce, Science and Transportation two weeks after the shootings took place, Chaput claimed that violence in games had a "direct impact on youth and is among the roots of real-life violence." Seeing as how Chaput was a pretty adamant foe of games back then, it's not surprising that he still hates them. That said, I'm willing to bet that Catholic priests have done more harm to the youth of the world than videogames have, though this wasn't something that the Archbishop addressed in his article.